2902, Cream Color, Hindu Cards. An excellent card with beautiful 3-dimensional arrangement of Dulha-Dulahn sitting in Phere i.e. the wedding ceremony. 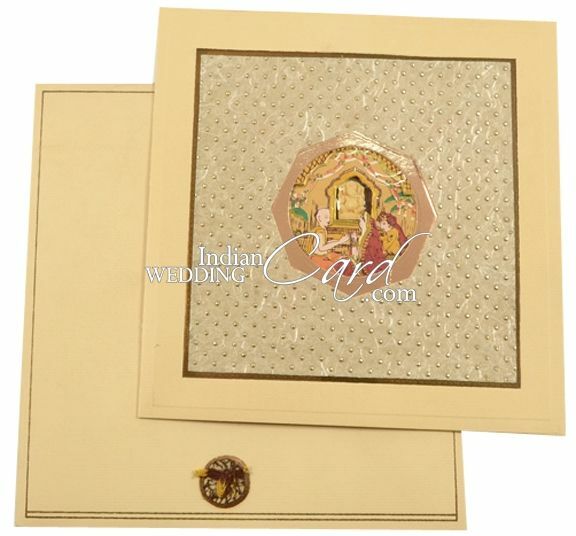 A handmade brown paper with block print golden dots all over give the card a rich look. A tassel adds to the beauty of the card. 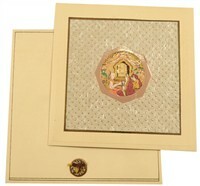 The envelope has handmade paper circle with block printed dots and a thread and supari paste up. Interleaf has golden line border.